A chance for change. This is what PagBAG-o Project wants to impart to every Sendong survivor in Xavier Ecoville. The project is a collaborative effort between the unemployed housewives of Xavier Ecoville and the Xavier University alumni, supported by different establishments in Cagayan de Oro. “As the PagBAG-o Project celebrates its first year anniversary, we do not only laud the Kagay-anons’ creativity but also their resiliency. Seeing our villagers elevate their lives through different enterprises inspire us because these projects don’t just give them the chance to earn but also gives them a lifetime opportunity to embrace change for themselves and for the community,” Therese Baliwag, Xavier Ecoville Development Program Officer, said. As part of its continuing efforts to boost Xavier Ecoville’s livelihood program while advocating sustainability, Smart Communications Inc. (Smart), in partnership with Primavera Residences and other stakeholders, has provided support to its bag-making enterprise, the PagBAG-o Project. Aside from producing katsa bags, PagBAG-o sewers also upcycle used tarpaulin banners. Tarpaulin materials used for marketing and advertising are made into eco-friendly bags to lessen waste by repurposing it into useful, high-quality bags. Project Zero, a similar program in GK Sooc, Iloilo City became the blueprint for the tarp bag program. “Inspired by the success of the project in Iloilo, we thought of replicating it in CdO,” Judee Caroline Chaves, Smart Sr. Public Affairs Officer, said. “Last July, Smart and Ecoville representatives visited the Iloilo community, and by August, we invited the GK Sooc sewers to CDO to teach Eco-ville housewives techniques in sewing tarp bags,” Chaves shares. In continuous support of Sendong survivors, different creative groups from CdO came together to organize the trainings, conceptualize the activities, and design the bags. “Aside from providing livelihood opportunities for mothers, this project truly showcases the generous spirit and skills of Kagay-anons. The PagBAG-o project brought together CDO’s best talents, in support of a great cause,” Chaves said. Primavera Residences, the first eco-friendly building in Cagayan de Oro, fully backs this project by promoting the city’s campaign to a clean and green environment. “As a sustainable developer, we consider it not only our social responsibility, but a huge honor on our part to be able to support a very worthwhile project. The PagBAG-o project not only helps the environment but also provides assistance to the communities that need it most. This has always been the advocacy of Italpinas, and through supporting this project, we hope that more and more people will take part in generating ideas that could help promote sustainability while also addressing livelihood requirements of communities,” Jane Montebon-Duterte, PR & Marketing Manager of Primavera Residences, declared. These upcycled bags will be featured in a photo exhibit this coming November 15-23 at Limketkai Center. The event’s highlight and finale is a fashion show with the bags modeled by local ambassadors on November 23, 4PM at Rotunda Limketkai. “This is a celebration of Kagay-anons’ creativity, resiliency and community spirit. This project also promotes eco-friendly products that would change the buyers’ perspective on purchasing quality goods. This means more reason to also give back to what nature has provided us. 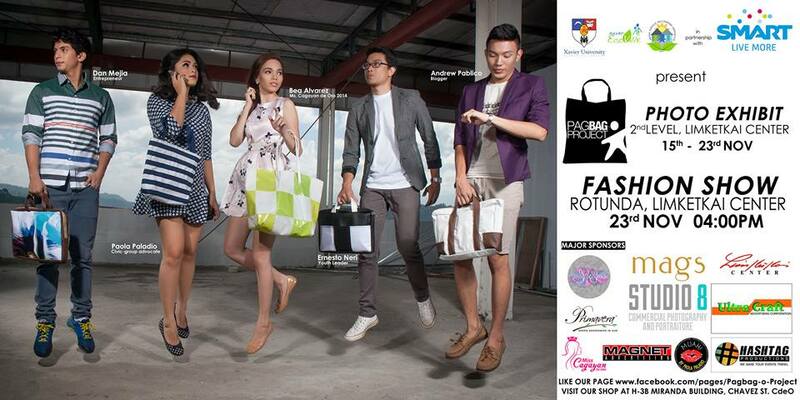 Thus the start of eco-friendly enterprise of quality bags,” Baliwag concludes. For more information about Primavera Residences, the country’s premier eco-friendly development, visit www.primaveraresidences.com.